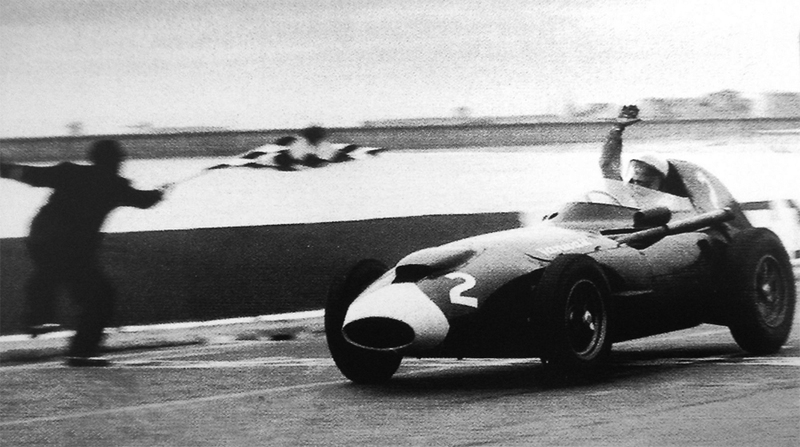 After successive races where his Vanwall failed to last even half the distance, Stirling Moss cut Mike Hawthorn's lead in the drivers' championship to five points with victory in the Portuguese Grand Prix in Oporto. But it was Moss' post-race intervention when Hawthorn was facing disqualification which has gone down in Formula One legend. It was the first Portuguese race held on the tricky Boavista street circuit, complete with tramlines and a slippery cobbled section. In cloudy weather on a track left damp by earlier rain, and in front of 50,000 people, Moss took the lead on the opening circuit but was overtaken by Hawthorn on the seventh lap only to regain the lead a lap later. The pair continued to battle and in doing so opened a gap over the chasing pack from which Jean Behra (BRM) emerged. Behra moved into second when Hawthorn was forced to stop to check his brakes, but 11 laps later Hawthorn passed the BRM, and then Stuart Lewis-Evans completed a great day for Vanwall by nipping in to take third. Moss and Hawthorn were once again the main protagonists battling it out for the first eight rain-interrupted laps. Moss then pulled away as Hawthorn slipped behind Behra in the BRM until he hit spark plug problems. But the drama was only just beginning as a protest was made against Hawthorn who, it was claimed, when he had restarted his car had driven a few yards in the wrong direction, a disqualification offence. As soon as he heard Moss headed to the stewards and told them Hawthorn had been on the pavement when he was spotted and so not breaching the rules. Moss' evidence swung the decision and no action was taken. Had the protest been upheld then Hawthorn would have lost seven points - six for finishing second and an extra one for recording the fastest lap. In the event, Moss' sporting intervention allowed Hawthorn to win the drivers' title by one point - from Moss.